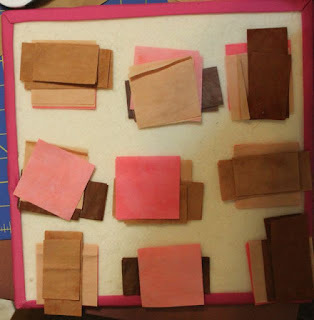 The end of February nears and I have made little progress on my brown scraps. Maybe today will be productive? I was in Gainesville with my AP Biology class this week on Tuesday and Wednesday and came home to parent teacher conferences on Thursday. I am so looking forward to some relaxation this weekend! Hopefully you have all gotten more time to dig into your brown scrap bin, mister linky is below so that you can share your update with us all. 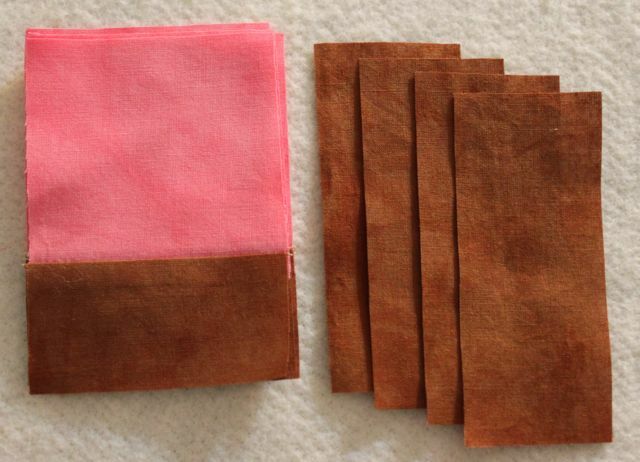 A new color is right around the corner, so enjoy the last scraps of brown. Just one more brown Saturday after today! 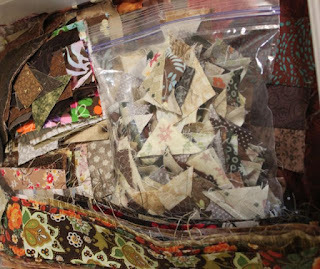 I hope that is enough time for everyone to make a dent in the brown scraps. 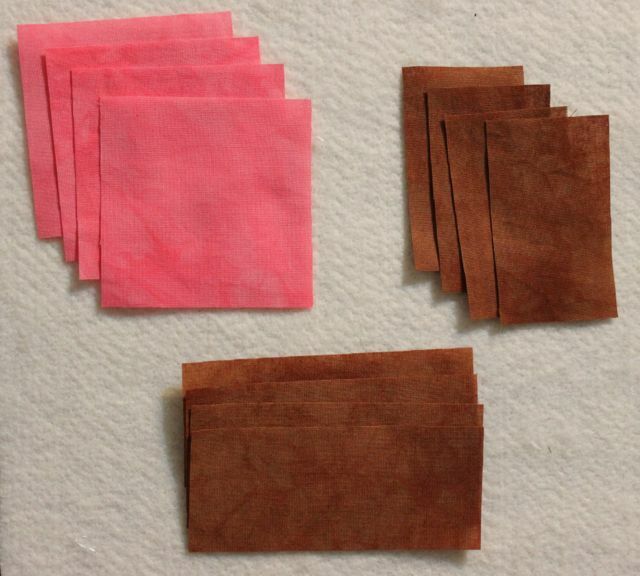 For the most part brown is not nearly as overwhelming as blue in shear volume of material. 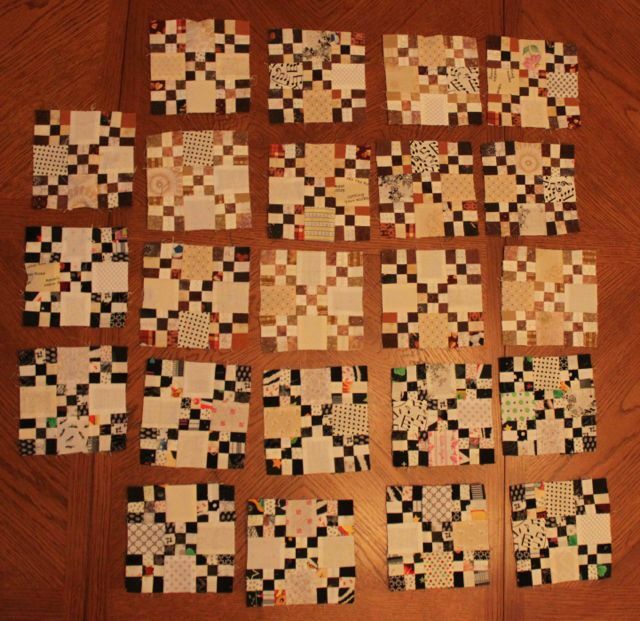 I did manage to finish off enough churn dash blocks last weekend, though not much else was sewn. I was thinking that this weekend was going to be a good opportunity to sew, but it is starting to fill up with sleepovers, lacrosse, robotics and power lifting. Life is pretty full right now, but is all good and happy. 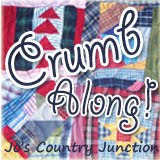 Hope you are finding some time to sew. Misterlinky is below for all your brown progress. 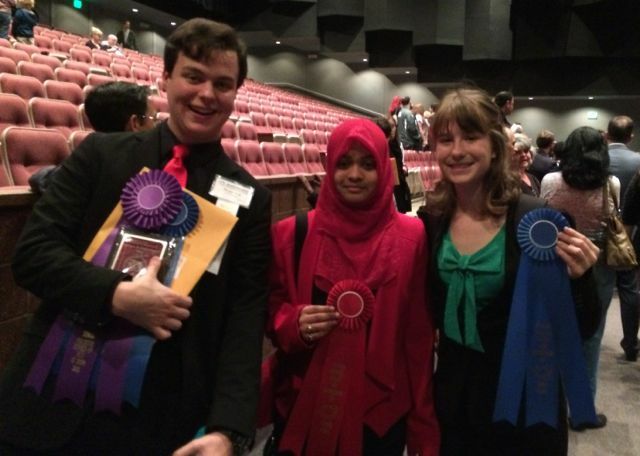 Another regional science fair has come and gone. 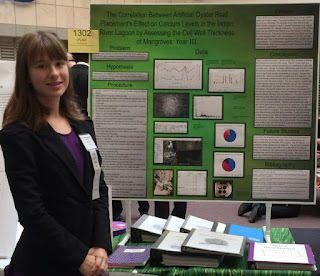 Anna had fun doing her project this year and learned how to use scanning and transmission electron microscopes. 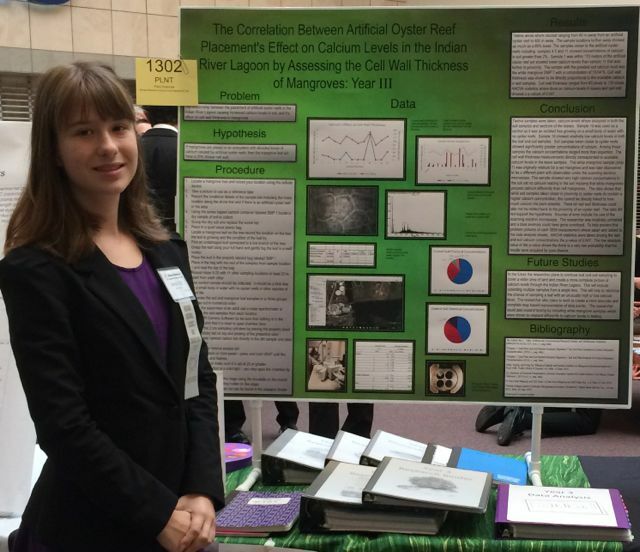 She collected mangrove leaves near oyster reef restoration projects to see if the added calcium had a positive impact on the thickness of the cell walls. She got her first ever first place ribbon! She was so excited and will be going on to the state science fair! She also got an invitation to the Genius Olympiad again which was the fair last summer in upstate New York. Fatima was in the computers and math category this year and finished second to the best of show winner. Not too bad at all! There was also a college scholarship and some cash and a backpack from the Air Force. I'm forgetting something I am sure, but it was a great night all around. River was first again in Animal Science, and runner up for best of show. That means he has a run off to find out if he will get an invitation to the international fair. 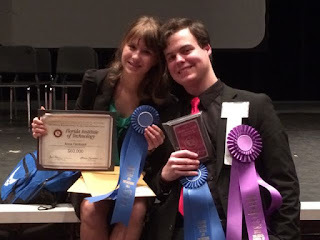 We went out to dinner after the awards and Anna was all tired out, but happy and excited. I'll spend today getting caught up on all that I missed yesterday. 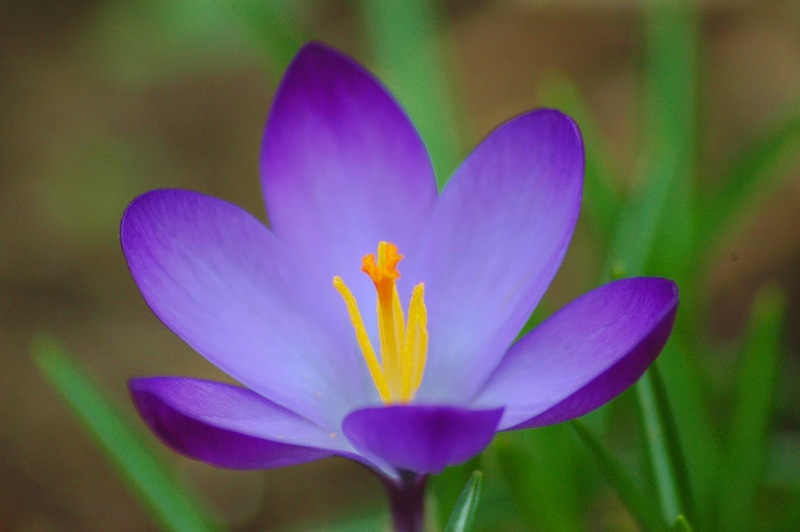 I glanced at the ScrapHappy Saturday posts, but haven't taken the time yet to leave a single comment. Bad hostess! Plenty of time to fix that, I'm sure all the kids will be sleeping late. I think that today, I will work on some of the churn dash blocks to go with these nine patches. 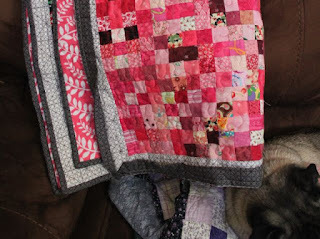 I am determined to finally finish this OMG quilt up this year. There are a few more nine patches which have been worked in leader and ender style. It will have to wait until this afternoon though. Anna is waiting anxiously for me to take her to science fair. Judging will take all morning and awards are tonight. There will be time in between though, and sewing is part of my grand master plan. What brown schemes do you have brewing today? Misterlinky is waiting for your weekly report. I'm thinking of calling this one Via Airmail. 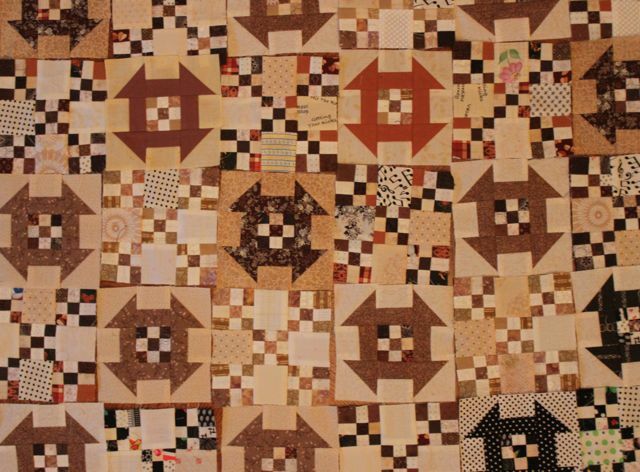 It is made of the leftover postage stamp blocks from projects of the past. Postage stamp blocks are so versatile. The binding was finished during the Superbowl on Sunday, but today is the first day I've been home during daylight. It was an early release day, so Lacrosse practice was done by 4:30. Robotics started at 5:30, but Kurt took Ryan down and is picking up Chinese food on the way home. Yum! The hard part will be making sure that someone stays awake long enough to pick him up again at 10. Yikes! 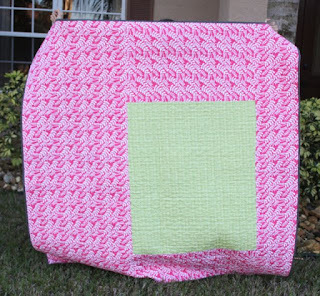 The back comes from some pink and green flannel leftovers. 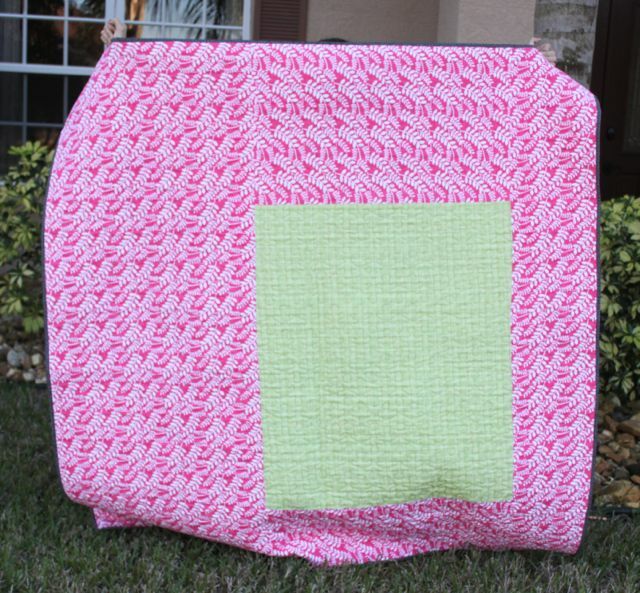 I think the pink was on clearance, and the green was part of a baby quilt perhaps? I've grown really fond of the frame square backing. 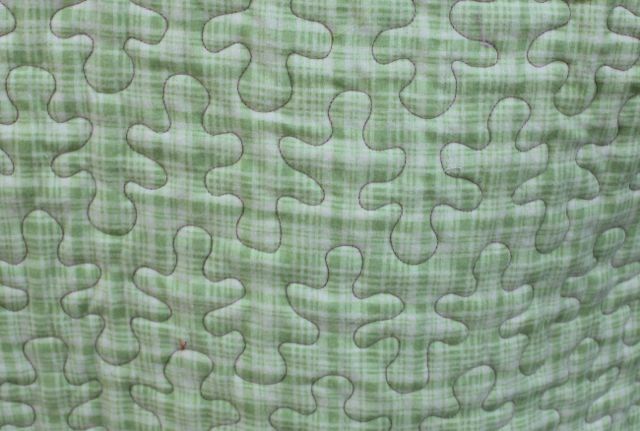 It almost looks preplanned, but makes good use of relatively random amounts of two fabrics. 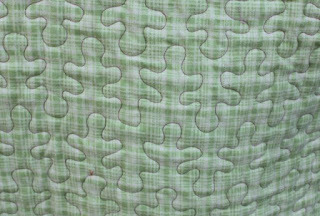 Finally, here is a shot of the quilting. It is a pantograph! That is two in a row. Such a departure from my usual freeform style. Just two more days until Science Fair. I'm trying to help Anna assemble her board in between typing this, so forgive me if the sentences seem fragmented. 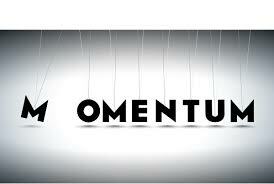 Some days I move faster than others, Today I am moving like syrup on a cold day. I set up a little assembly line yesterday and got all of the pieces ready to go for patience corners. We ended up having to run around most of the day, and a little fabric cutting was all I could manage. So Sydney now has some new Ikea drawers for her closet, and Kurt got his car back from the dealer in Orlando and I have some antibiotics that the doctor says should help me feel better any day now. After all that running, hanging out on the couch last night was a top priority. 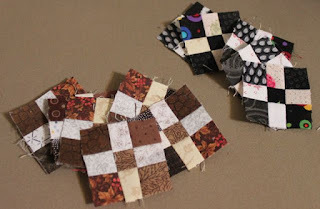 This morning though, I was able to sew together the February column along blocks. 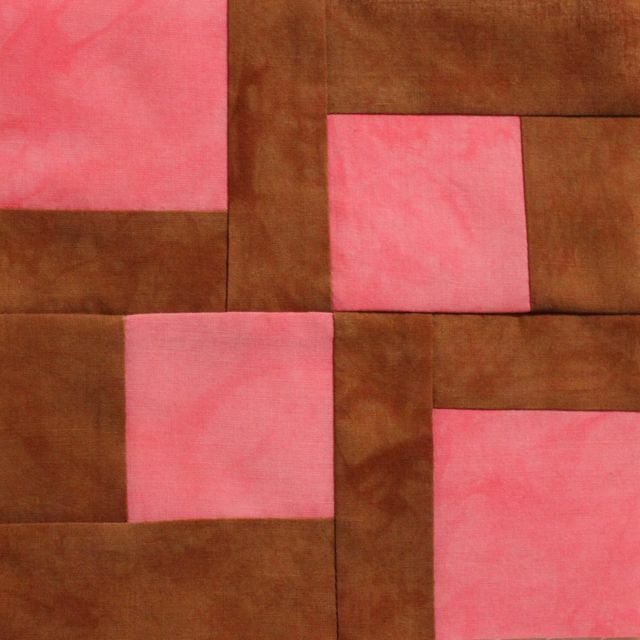 I decided to just put pink in two of the squares and use light brown for the corners. I think it adds nice motion to the blocks. 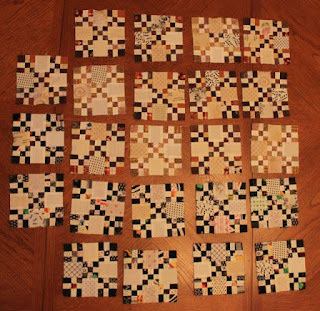 I was surprised when I laid the blocks out next to the January blocks to find that they were not the same length! I had to go and dig out a tape measure to find out that January was too long by 1.5 inches and February was too short by .5 inches. I will work on making all the math add up later I suppose. Ideally, all the rows should be 72.5 inches unfinished. 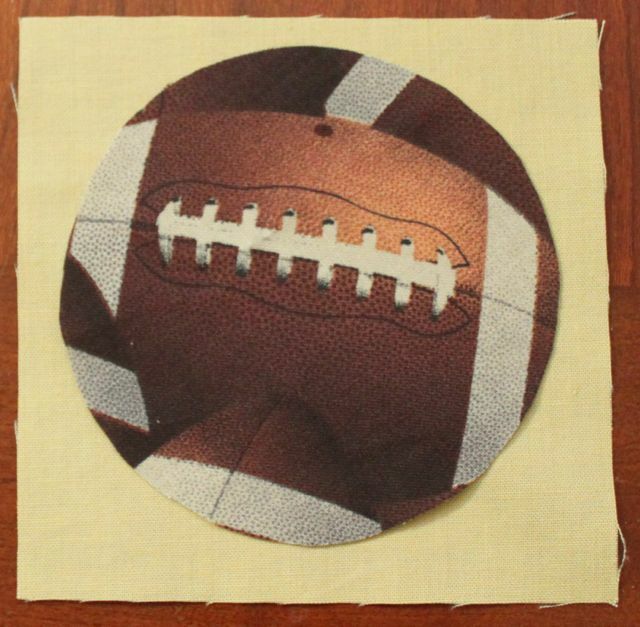 While playing with the browns, I was happy to find this football fabric in honor of super bowl Sunday. Maybe I will stitch it down during the game. We are supposed to go to a party, but I am thinking of letting Kurt go without me. I'm sure he wouldn't mind. That would give me some extra time to finally finish the binding on my postage stamps. I thought it would get finished up during Lacrosse on Monday, but not quite. Then it was so cold on Friday that I went to a nearby mall and hid in a restaurant eating fries until practice was over. Poor Sydney said she could hardly hold the stick because her hands were numb. Check out this photo I got yesterday from Jill who does not have a blog. 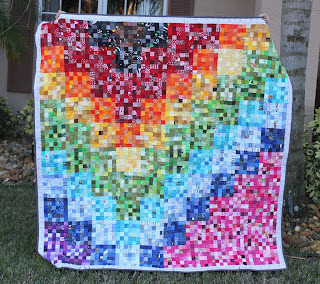 She made it for last year's Rainbow Scrap Challenge. Isn't it fabulous? 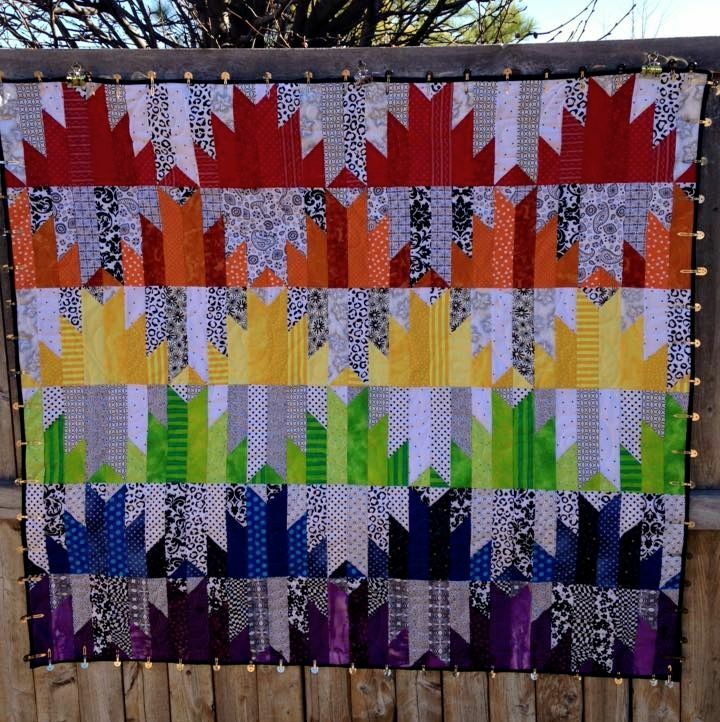 I really love the look of the black and white prints with the rainbow brights. It looks like she is also on the binding phase. 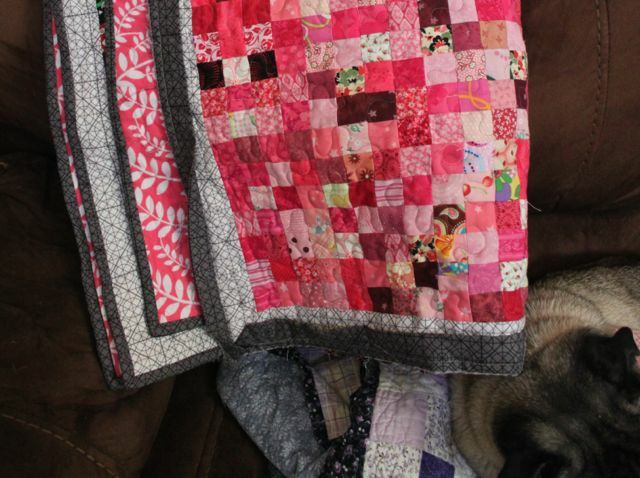 Hope she is enjoying some slow stitching too on this Superbowl Sunday. 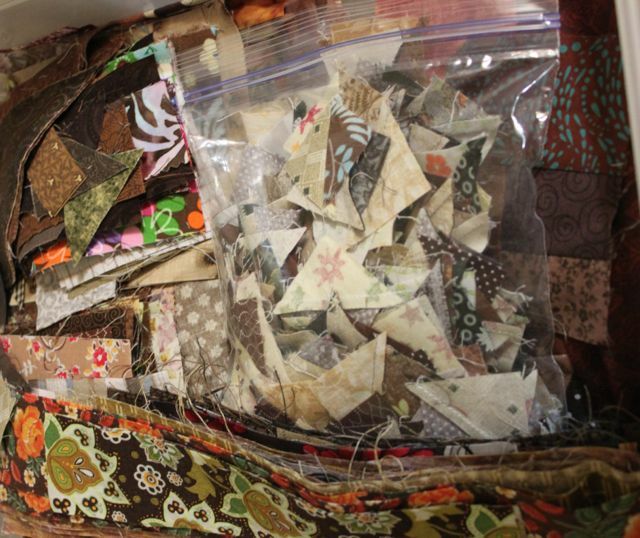 Be sure to visit Kathy for more slow stitching and Cindy for Oh Scrap! The block this month is a nice simple one called Patience Corners. I chose it for the nice diagonal secondary pattern that it will make in a column. 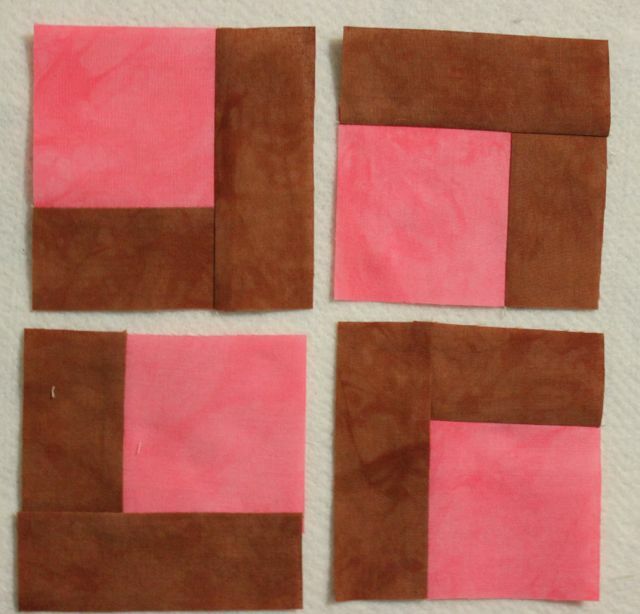 4 - 1.5 by 3.5 inch rectangles of brown. 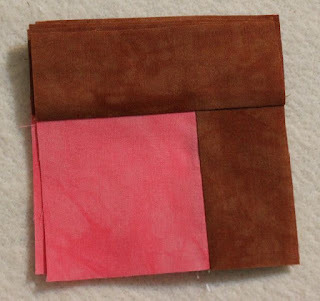 Start by sewing a small brown rectangle to one side of each square. Press toward the brown. 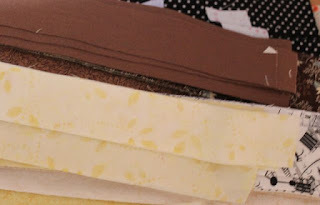 Next, sew a large brown rectangle to one side of each twosie. Now you have 4 identical subunits. Arrange them so that two diagonal corners have the brown side toward the center of the block and the other two have the brown side on the outside of the block. 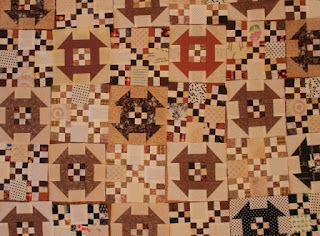 Sew together as you would for any four patch. When your block is done, the brown will make a visual figure 8. The block should be 6.5 inches at this point. it will finish at 6 inches in the final quilt. 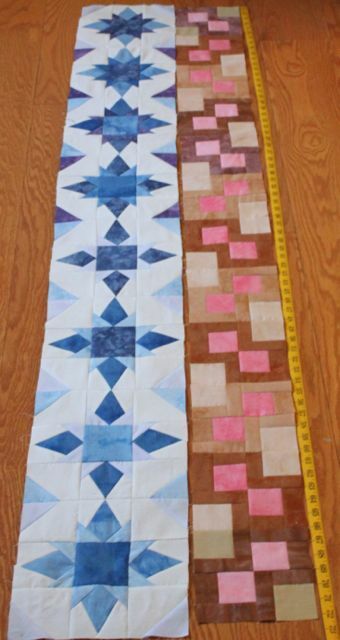 You will need to make 12 blocks for the large quilt and 9 for the smaller version. Keep scrolling down to the last post for today's linky party. 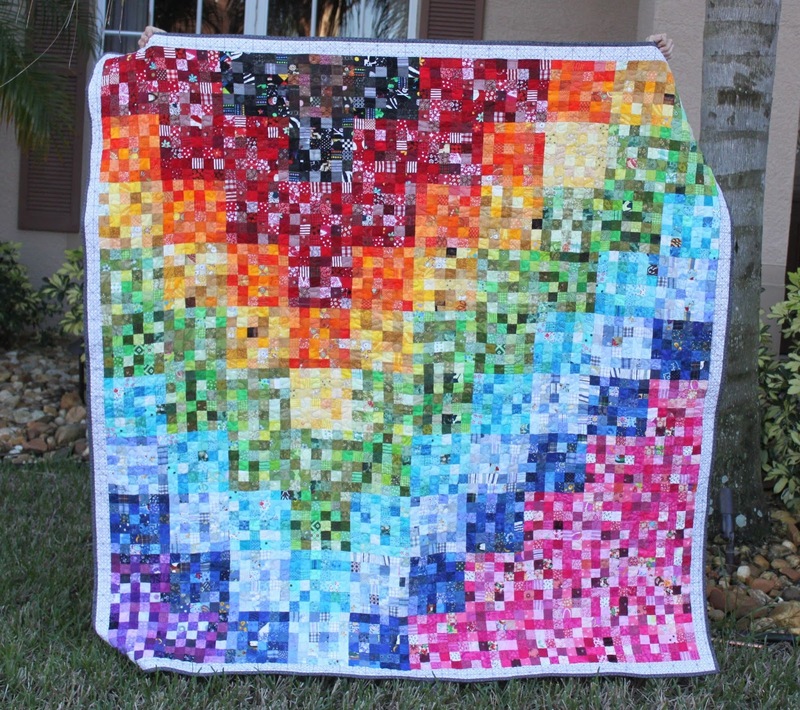 I'll link the PDF of this block to this post as well as the RSC16 Sampler tab as soon as it is done.